Birthday Quest 2018, Part 5 of 6: Four Far-Flung Felines « Midlife Crisis Crossover! By this time it was afternoon, a bit behind schedule. We’d lingered longer than anticipated at some of the stops that contained more points of interests than a single Garfield. We had to be more mindful of our minutes because there was a chance the final stop on our tour would be subject to a timed aspect. We would already be missing the one Garfield that was out for repaints, and were determined to miss none due to travel delays. Admittedly, losing my place in the directions on the way back from Marion’s big, distant golf course didn’t help. Thankfully Google Maps helped me get my bearings. Next stop west of Marion was the town of Sweetser. Their origins date back to post-Civil War times when the Pittsburgh, Cincinnati, Chicago and St. Louis Railroad (bit of an awkward name) laid tracks through the area. A railroad switch leading to a refueling station was built along the line, which in turn spawned an entire around it. The town of Switch eventually corrupted its own name into Switzer, which later evolved into Sweetser. They’ve stuck with the latter ever since. 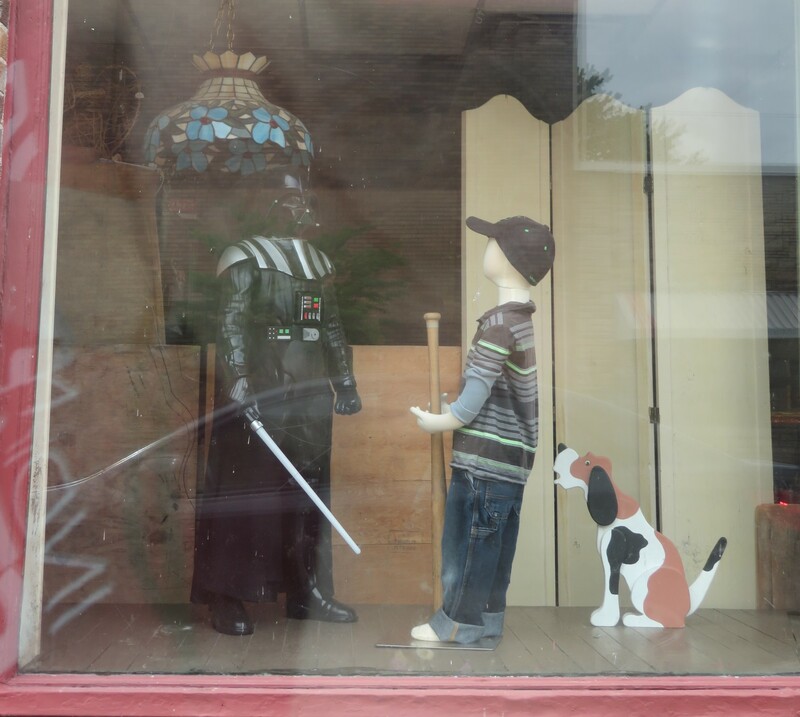 A series of small businesses along their Main Street seemed healthy and in good spirits. The Sweetser Cafe, next door to our target. Regrettably time was short, our appetites hadn’t returned yet, and they were closing in a few minutes anyway. The railroad pulled up stakes in the 1980s, but a three-mile tract of it has been converted into the Sweetser Switch Trail, a charming walkway with train-related artifacts and markers positioned here and there alongside. We sadly didn’t have time to explore much of its length beyond the immediate objective. 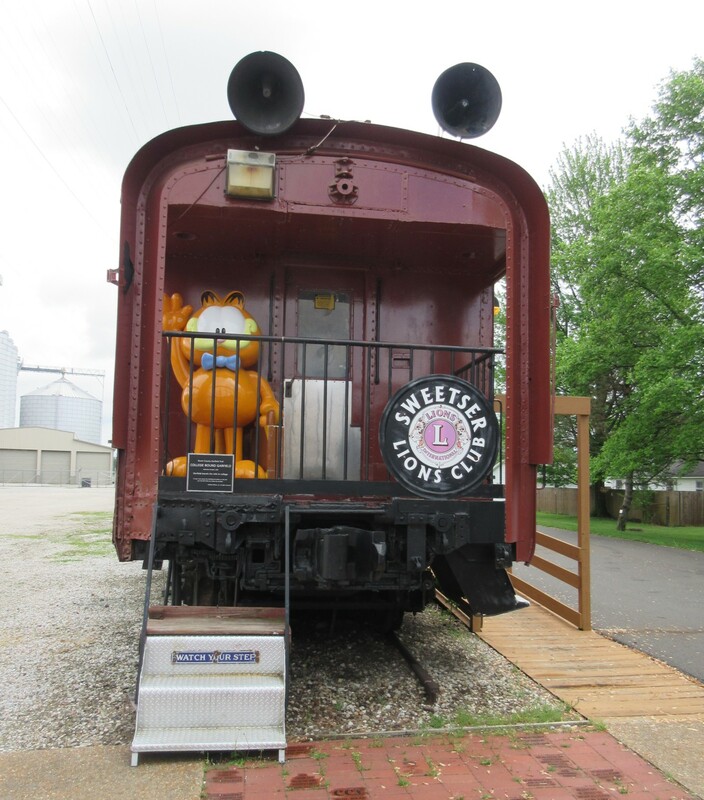 Apropos of their history, their Garfield is aboard an old train car. 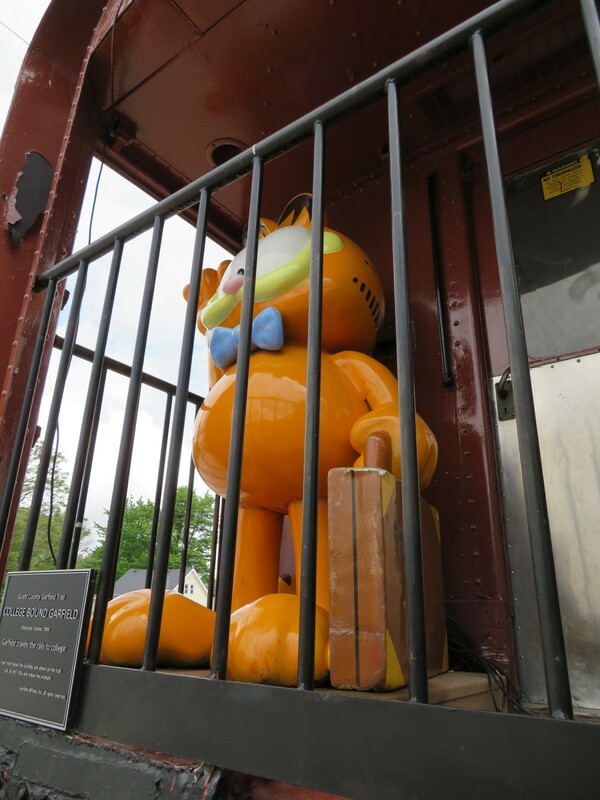 #7, “College Bound Garfield”, impossible to get a head-on shot around the bars. Garfield’s gate was locked and discouraged climbing over. Our awkward lead photo was my attempt to reach as high as I could and shoot over the bars. I created a haunting visual but not quite the results I’d imagined. 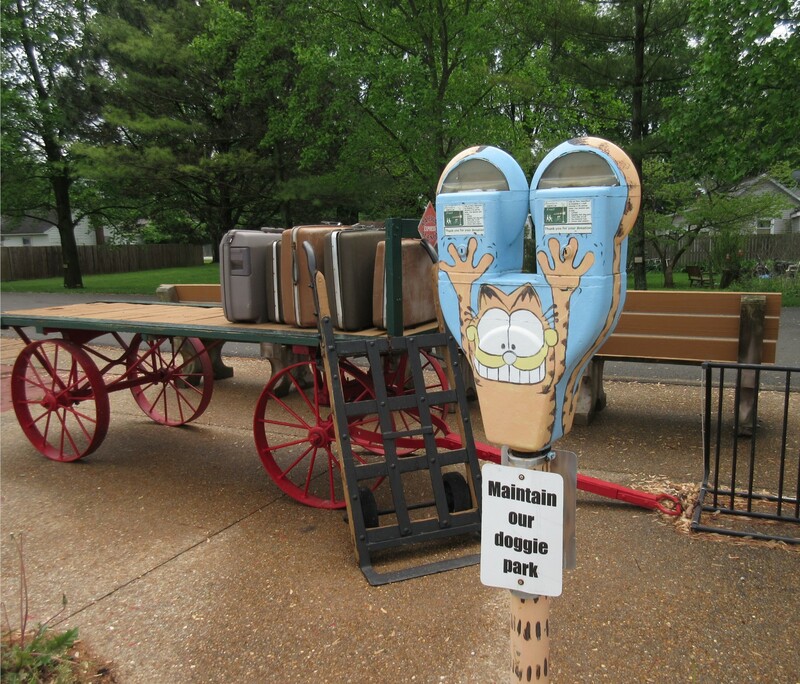 Special trail features nearby included vintage luggage and a Garfield parking meter, now accepting dog-park donations. Odie would approve. 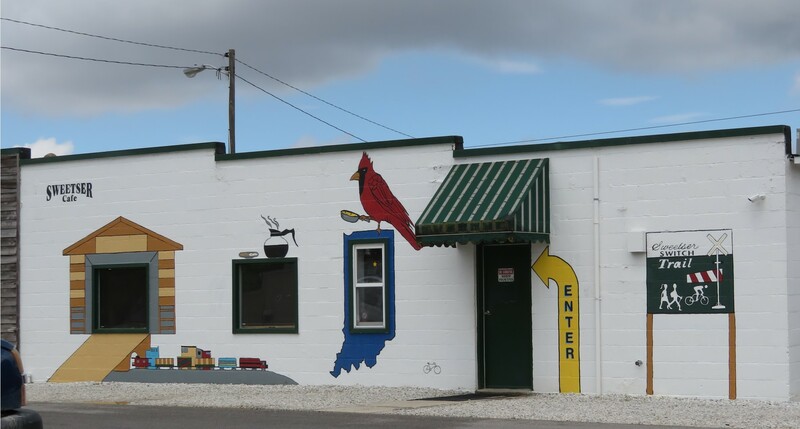 Due south of Sweetser, I missed a turnoff but relied on a fact I’ve picked up on over our years of Indiana road trips: when you’re lost on Indiana county roads, it’s not hard to get where you’re going anyway. They’re nearly all rectangular and eventually lead to the same places. Just turn right at the next street and you’ll be back on your way in no time. We found our way simply enough to Swayzee (literal motto: “The Only Swayzee in the World”), whose origins dating back to the 1840s. 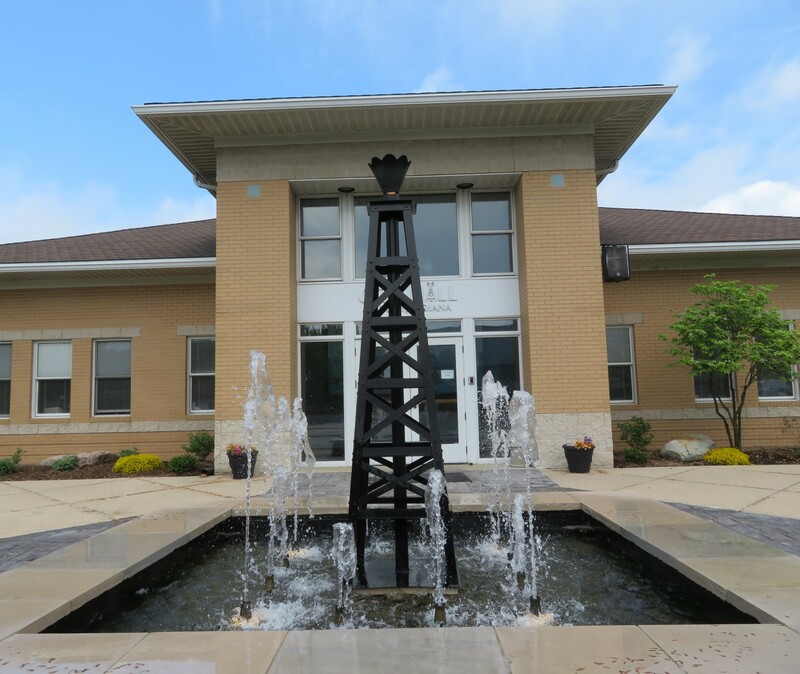 Named after the original landowner at the time of their 1881 incorporation, Swayzee was once a railroad town like Sweetser, and was once a natural gas haven like Matthews and Montpelier. Misfortunes plagued it harder than those other neighbors — beyond the gas deposit depletion, there was the 1901 glass factory explosion, as well as the sporadic terrible fires over the next twenty-five years that would claim their lumberyard, two churches, and their flour mill. Notable past Swayzee residents include Dr. Aaron Wesley Dicus, the preacher/physicist who invented the automobile turn signal. A core community remains today, large enough to merit housing the area’s main elementary school, where their Garfield stands. 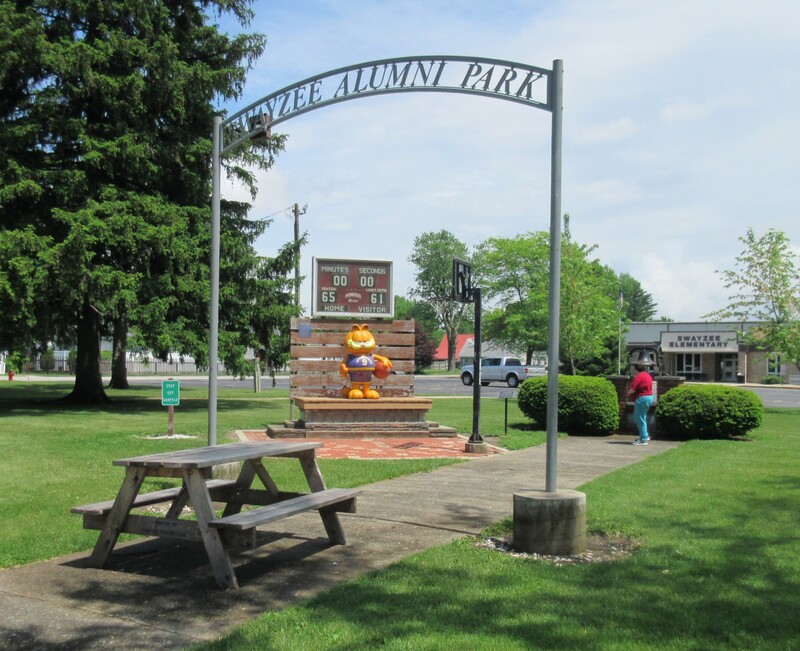 Surrounding him is Swayzee Alumni Park, in honor of the erstwhile Swayzee High School basketball team that won a championship going into nine (9!) overtimes. That park and that school. 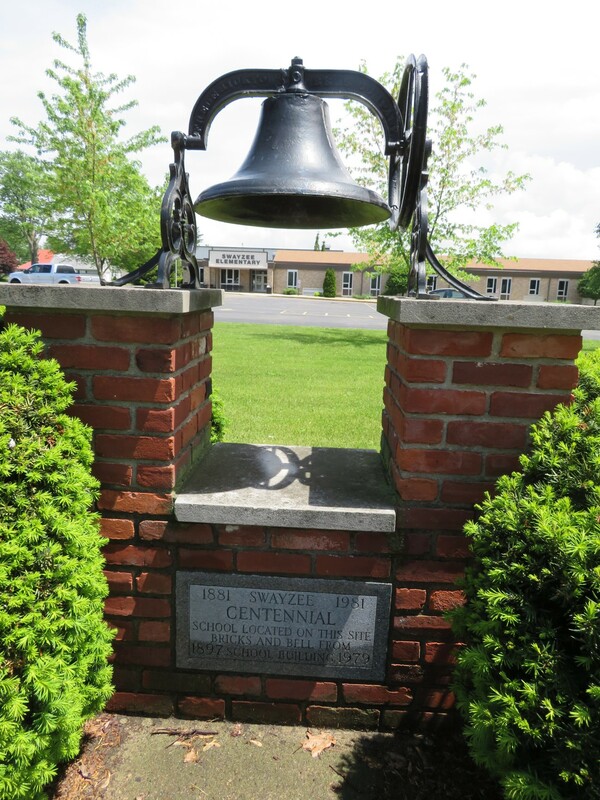 The Swayzee Centennial Bell, est. 1981, standing atop bricks from the original schoolhouse torn down in 1979. 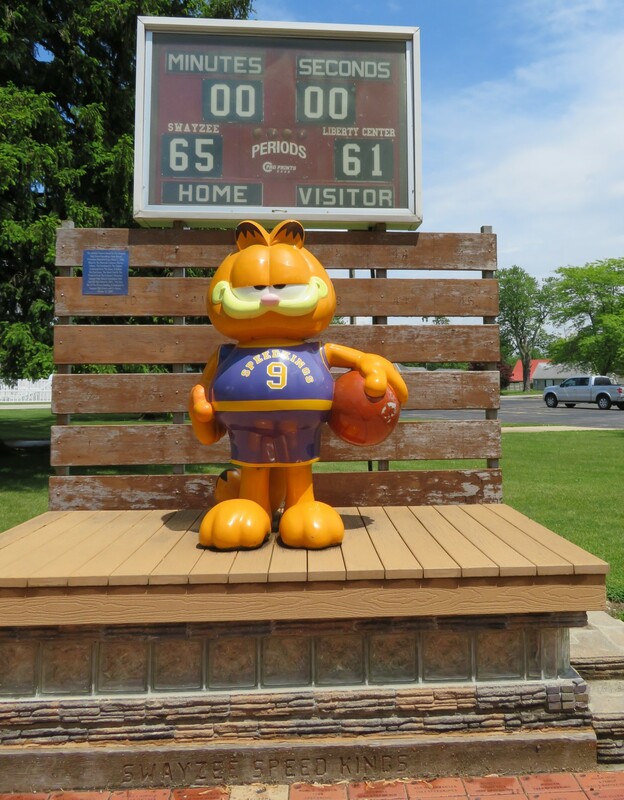 #8, “Speedking Garfield”, named after that basketball team. 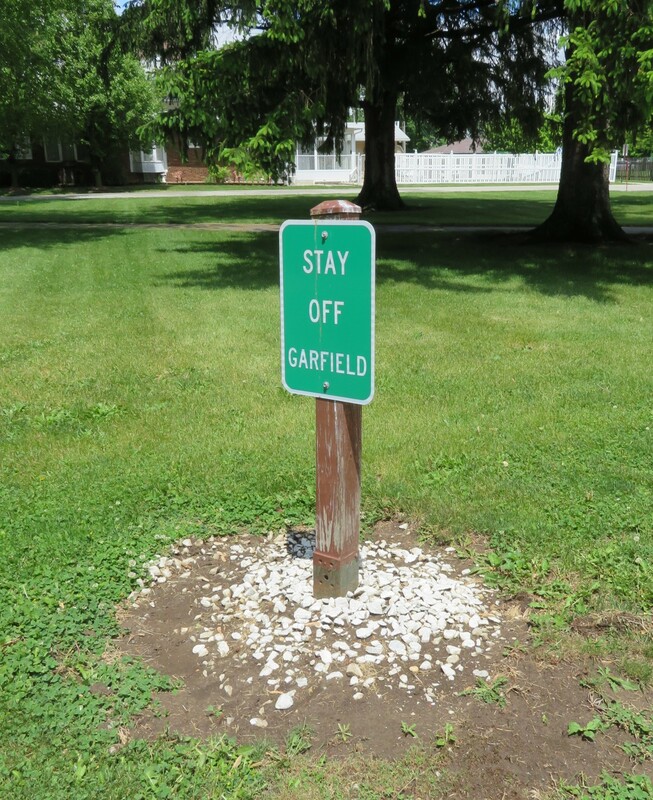 Sweetser wasn’t the only town insisting visitors resist the urge to touch Garfield. From there we headed east to the slightly larger town of Jonesboro. Assuming they have a backstory, very few details from it have been posted online. It was founded in 1836 by one Obadiah Jones. A fellow named Harry Knight hailed from there and drove in the first two Indianapolis 500s before he died on an Ohio dirt racetrack. 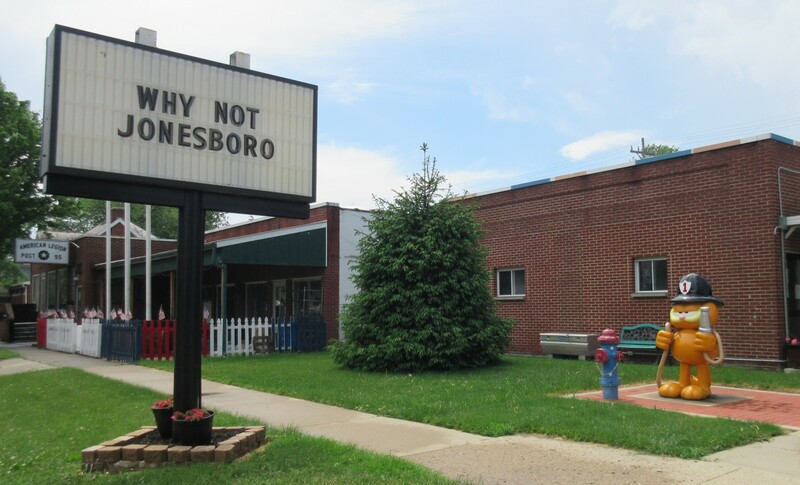 And then Jonesboro continued existing. The End. Obadiah’s old cabin remains a local attraction and has a historical society that’s handled upkeep and renovations. They have a history museum, open weekends 1 to 4, but we had to limit our visit to a quick drive-by. 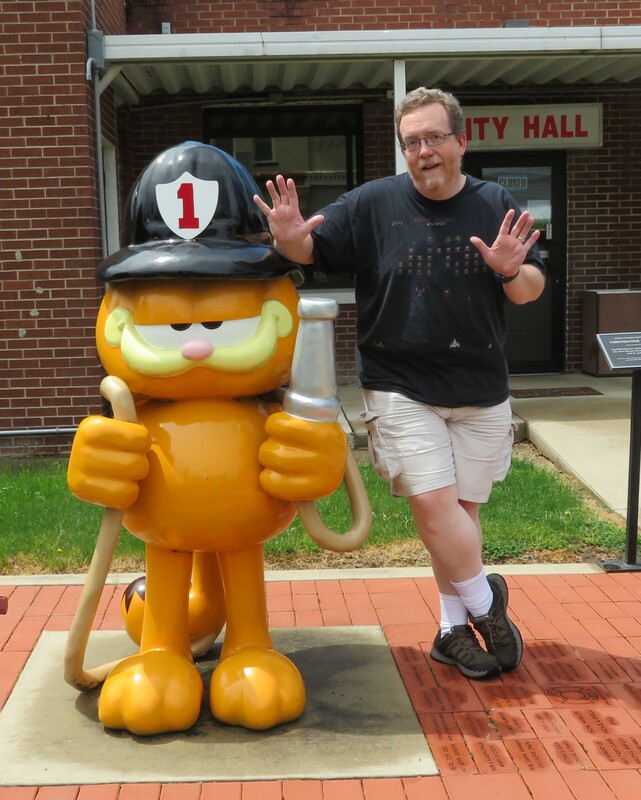 Their Garfield is in front of the City Hall/Police Department, down a bumpy brick street that ensures speeders aren’t a problem out front. We arrived and parked on one side of the building just as an officer was leaving on the other. No one else appeared around. A few blocks over from Jonesboro is their larger neighbor Gas City. Once upon a time in 1867 a furrier named Noah Harris founded himself a li’l slice of life called Harrisburg. The population was up to 150 when the Indiana Gas Boom of the 1880s hit. Folks thought Harrisburg would be the epicenter of an unlimited natural gas source and would basically rule the world, and so their home was renamed Gas City. Factories and big businesses all moved in, secure in their dream of becoming Gas Kings in this brave new world of gas. Unfortunately no one told them gas is a non-renewable resource. As with the other towns on our journey, Gas City was shocked and appalled when all the gas ran out in the 1910s. Most of the larger businesses were scrapped or abandoned them. 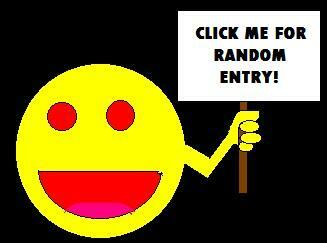 By this time, nearly 3000 citizens had entrenched themselves in solid everyday living and life found a way. 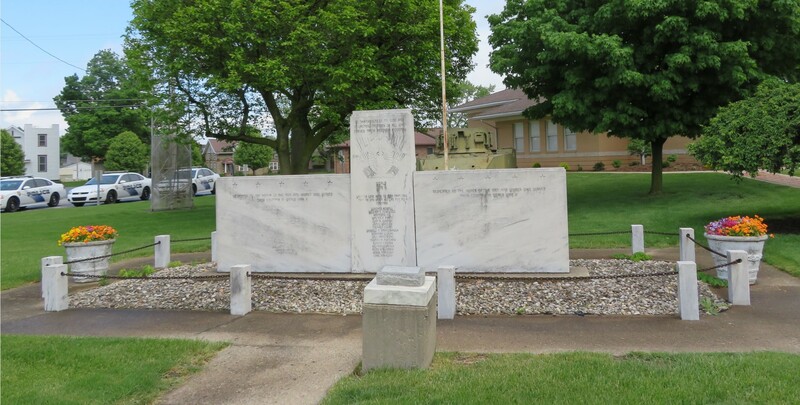 Gas City persisted ever after without its namesake. Their population today is twice what it was during their gaseous heyday. Of all the towns on the Garfield Trail, theirs was the only place where we drove past a dude with heavy bass booming out of his car windows. 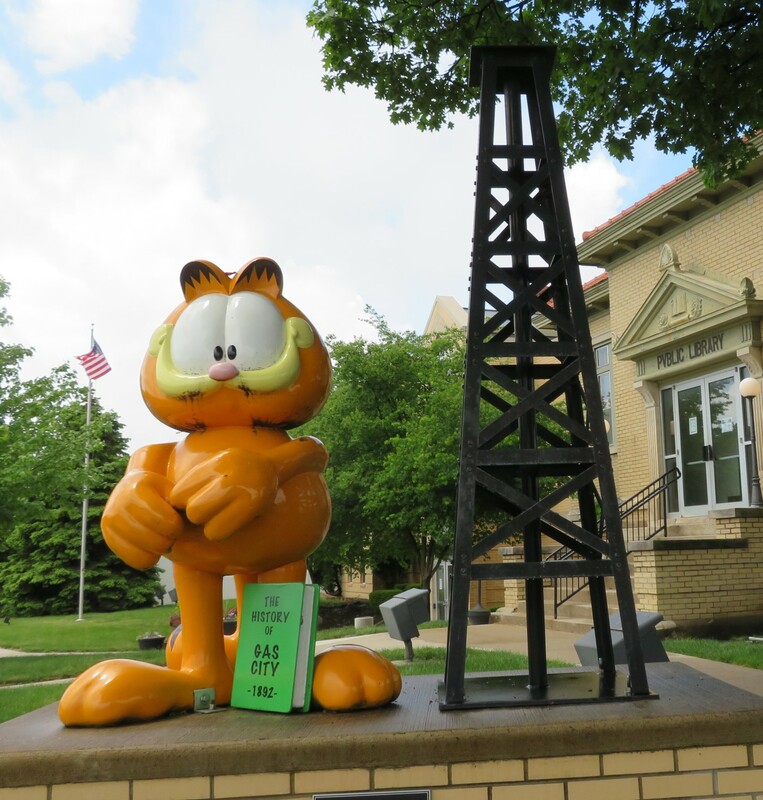 Their Garfield stands in front of the public library. We parked at a free lot down the street, past the police station and not far from their tank. An M5 Stuart light tank, if online sources are accurate. Once Montpelier got themselves a fighter jet, it was only a matter of time before other towns would feel the need to compete. 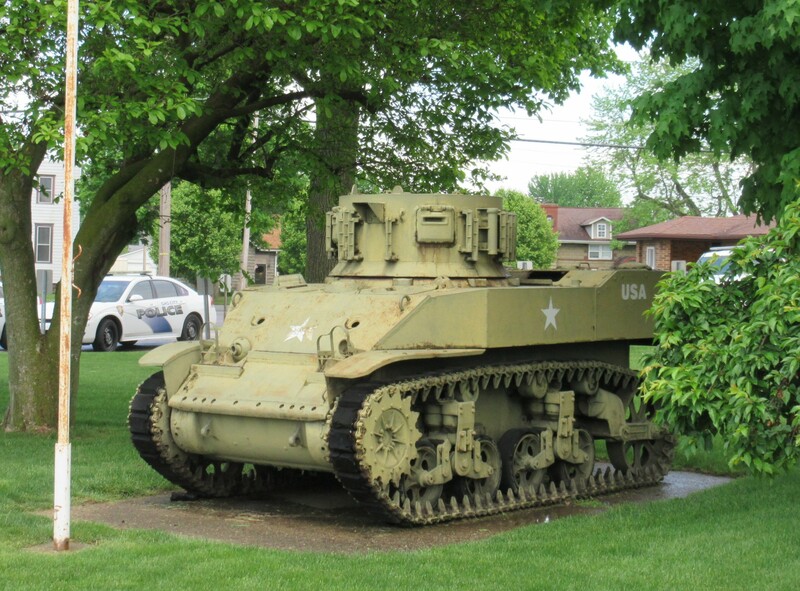 The tank stands behind their official war memorial, est. 1992. The Gas City City Hall, complete with fountain and decorative gas derrick. #10, Glass Blower Garfield, in remembrance of the glass-blowing companies were among the major concerns that once put Gas City on the map, only to leave town later. 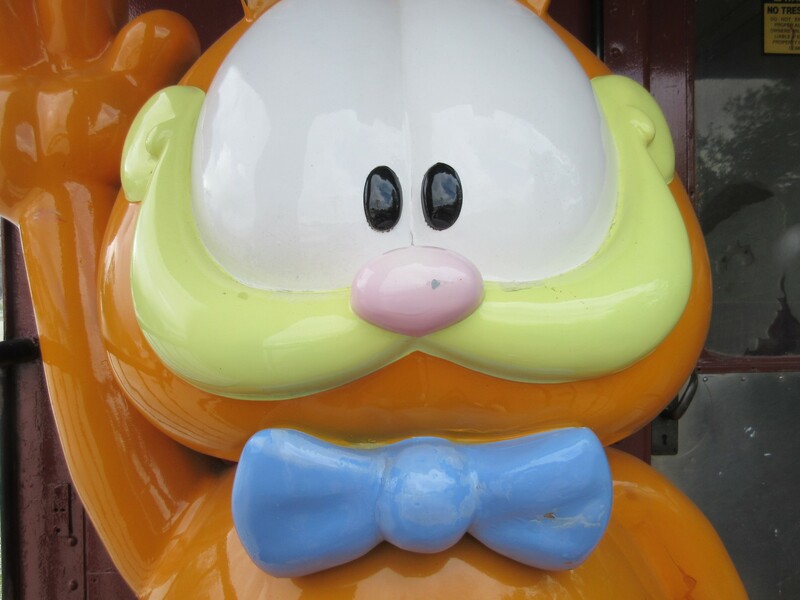 Theirs was the Garfield most in need of some touch-up work. We stepped into the library for a few minutes’ refresher and perused the castoff items for sale on tables in the front hall. We came away with gratitude for their fine facilities, and I bought myself a deeply discounted but blessedly unscratched copy of Prince’s Musicology. He wouldn’t be the last cool cat to pop up on this trip. The count stands: ten Garfields down, one to go. To be concluded!